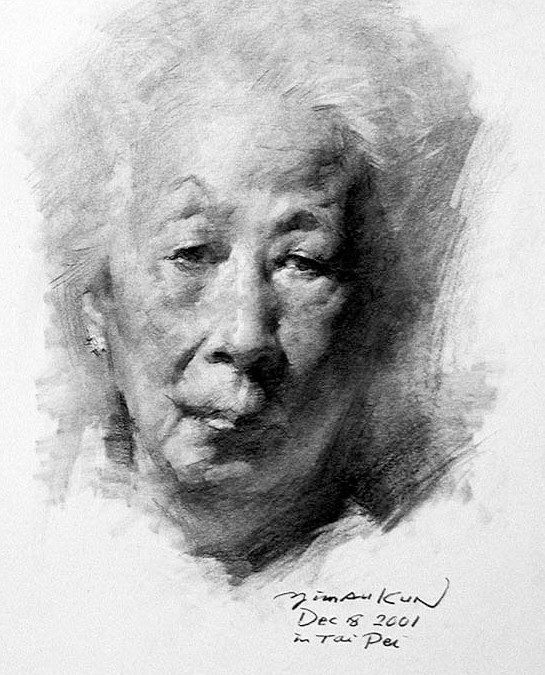 I was a student at the Affiliated High School of the Guangzhou Academy of Fine Arts in the early 1960s. When I first saw the drawings of the human form that Prof. Guo Shaogang (郭紹綱) brought back after studying in the Soviet Union as an exchange student, I was absolutely stunned! 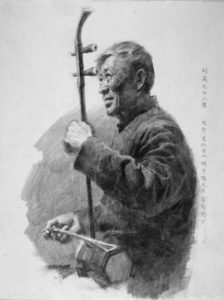 In the summer of that same year, I traveled to Beijing and visited the Xu Beihong Memorial Hall where I saw many of the original drawings made by the great master. Drawing has been my lifelong passion ever since. In the 1990s, I visited Europe and the U.S. There I gave particular attention to the drawings of Da Vinci, Raphael, Rembrandt, Ingres, Degas and Van Gough in the major art museums. I recently flew all the way to Russia to admire the great paintings by Chistyakov, Repin, Serov and Vrubel as well as the collection of the Repin Academy of Fine Arts. I feel as if I had followed in the foot steps of the great masters in taking cruise down the long river of drawing. The sights along the river are breathtaking to behold. I moved to Hong Kong twenty years ago then settled down in Taipei a few years after that. Due to popular demand and to make a living, I opened my teaching studio and became an educator. My work in art education over the years meant I accumulated many drawings and made some progress. Confucius was right when he said: “Isn’t there not joy in learning?” I at least enjoyed the exploration of drawing. 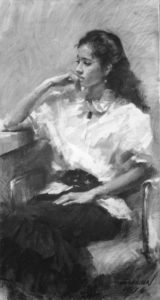 In continuing to re-examine and think about Realist painting and the teaching of drawing over the years, I gained a better idea of my path in art and enriched my own mind as well. I will briefly outline some challenges that I often come across for discussion. The legacy of Western Realist painting. It was not until the Italian Renaissance Period that Western painting evolved beyond two-dimensions with its planes and lines into the three-dimensions with solids, light and shadow that now characterize Western painting. This painting system was developed through the exploration of many artists and represents the cultural knowledge accumulated by mankind. In other words, it is not inborn knowledge. It must be taught and studied in a systematic manner. It cannot be easily obtained through so-called “genius” alone. Drawing is fundamental to painting. For traditional Western painting this conclusion still holds true. The emergence of the Modernist school as well as the Impressionist efforts to develop human color perception from the 19thCentury onwards led to drawing being neglected at one point in European and American art education. Leaving the modern schools aside, drawing continues to be fundamental to Realist painting. It is in fact of the utmost importance because it solves all problems related to form outside of the color factors. Artists interested in Realism should keep this in mind. So what is in drawing? Proportions, perspective, blocks and spaces are the essential elements of drawing. We study the relationship between these elements and explore how they fit together to define the bulk of objects and how they occupy space; we delve into the forms of art that give shape to this state such as lines, colors and brushwork. Applying all of the above to the depiction of structure and texture as well as expressions and psychology during the drawing of the human anatomy and characters represent an important topic in the study of drawing. 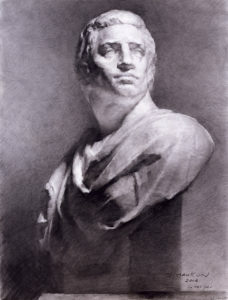 Is sense or sensibility the more important during drawing? The Russian art educator Chistyakov said that drawing is about sense though this mainly applies to color. Sense, analysis and comprehension are emphasized in drawing because ignorance of perspective and anatomy often leads to vacuity and weak compositions. Drawing is an art however so sensibility cannot be ignored either and must be applied throughout the drawing process. One must draw and sculpt. Making a study does not mean being “pedantic” about every detail. It is impossible for a “pedantic” artist to create oil paintings that feel like a painting and speak to the emotions. Is Realism a dying art form? I’ve seen with my own eyes how most visitors to art museums and galleries around the world still prefer paintings in the Realist style. They understand this kind of painting. One must admit to a great decline in the standard of Realist painting today. There are many factors at work and one of them is the over-use of the camera. The camera has been a boon to Realist painting in the West since it was invented in the mid-19thCentury. It provides painters with a very useful tool for recording ephemeral images and details. On the other hand, it often hampers the development of the painter’s own imagination and observation skills. The reliance of many people on the camera resulted in a flood of images that look like photographs. Such paintings are filled with unnecessary details. Like “a king who no longer bothers with morning audiences”, painters no longer bothered with plein-air painting. What a tragic state of affairs. But a drawing can look like a photo, you say. Yes, painting a good likeness does not by itself solve the problem. It must be an artistic likeness that has aesthetic value. This brings up the question of descriptiveness versus expressiveness. The core of descriptiveness is the “artistic rhythm.” There can be no art without rhythm. Rhythm is change – contrast and unity. In painting, rhythm takes the form of layers on a plane and all the different forms of brush work. One must be able to sense all the different textures in the subject in order to translate an actual object to the drawing paper or canvas – the conversion of living reality to artistic reality is necessary to breathe life into what is being described in the image. The painting ability of each person is mainly expressed through their mastery of form and sensitivity to rhythm. The training of both senses and skills is essential. The expression of rhythm is what truly separates craftsman from painter. Form and structure, mass and space, brush work and rhythm are all there to capture and shape the artistic image. Artistic image is the carrier of our thoughts and emotions. It is also the goal of artistic pursuits. When we look at the history of art in the East and West, the greatest artworks have all won renown and enduring fame through their vivid and thought-provoking artistic image. The shaping of the artistic image takes more than just skill and technique. It takes a sincere and sensitive heart – the sophistication and inspiration of a true artist. This is something that even the best art education cannot provide. It is something that we must cultivate and learn for ourselves. The short text above is but a brief discussion of my own personal thoughts on Western Realist drawing. It is only a basic discussion and does not go into the amount of depth that I would like. The description next to the painting mentions the background and my thoughts. 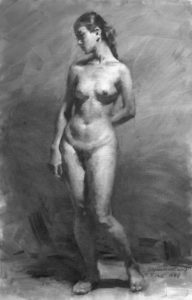 Some mention the principles of drawing and painting techniques in passing as well. As this is not a text book a dissection of each is not practical. I do hope that by increasing the reader’s understanding I can make it more approachable and make the book more interesting to read. Drawing is a wide and beautiful river. I hope more artists can join me in swimming in its waters and enjoy the splash of its waves.